Disclaimer: I believe that it is every mother’s right to choose what is best for her labor and delivery. I also realize that every individual circumstance is uniquely different. Here is my story. I woke up last Saturday, July 19th at 3:20am from an intense stomach cramp. I had suffered from what were likely Braxton Hicks contractions all Thursday night after a 4-mile run home from work that afternoon, and assumed that this cramp was the same. I closed my eyes again, and fell back to sleep, but was awoken by another cramp ten minutes later. Again, I shut my eyes, and awoke ten minutes later. The pattern persisted, and, two hours later, my husband Ray, who had gotten up to go on a 5-hour long ride, remarked that I should call my doctor’s 24-hour number. One of the doctors in the practice picked up the call, responding that he believed that I was in early labor, and that I could possibly have our daughter the next day. Little did he know that she would arrive that same day. I told Ray that he could go on his planned ride, as I assumed it would be a long labor, given it was my first, but I canceled all my plans for the day so that I could labor at home comfortably. Leading up to this day, I had planned to approach it as I would an endurance event, except that I would not be allowed to eat once I was admitted to the hospital whereas I always fuel during my races. I knew that I should eat food that was easy to digest but high in calories, and, at 9:30am, I crawled out of bed, and walked across the street to pick up an iced coffee and toasted whole wheat bagel with walnut and raisin cream cheese. The line was long at the popular bagelry, as usual, and I had to help support my body weight during contractions by leaning against the glass counter. I, then, visited the natural market next door to pick up cookies for the nursing staff, as I was told by my birth doula Caprice that they’d appreciate the gesture. I had wanted to run a few more errands in the neighborhood, but the contractions already made it uncomfortable to walk a block let alone a few, and I headed home instead, where Ray greeted me, having cut his ride short. I spent most of the earlier part of the day listening to reggae, bouncing on my birth ball, and sending last minute emails to the staff and teachers at my yoga studio, knowing that I could possibly be unable to do so soon. The contractions were seven minutes apart by 3:30pm, and I thought it’d be relaxing to labor in water. I texted Caprice, who recommended that I get into the shower instead of the bathtub, since I had been experiencing some bleeding, and suggested that I shower before reaching 5-1-1, or when the contractions are five minutes apart and lasting one minute each for one hour, as I could risk dilating completely and not make it to the hospital. I lit a scented candle, and reggae continued to play on my phone. Ray hopped into the shower with me to help bathe me. The hot water massaging my skin and Ray’s help were both immensely soothing, and helped to diminish the intensity of the contractions significantly. The contractions became more frequent–roughly five to six minutes apart–and lasted 90 seconds per contraction shortly after the shower. Between contractions, I was comfortable side lying on the floor, resting my head on Ray’s lap, and fell asleep out of sheer exhaustion, but the contractions were so intense that they’d shake me from my slumber, and force me to freeze in pain. I dry heaved after two of these contractions. I tried to kneel on the floor and rest my head on the couch, squat over two yoga blocks, and also get back on my birth ball, but these laboring postures were extremely uncomfortable at this point. I felt better standing and swaying with Ray while he made big circles with his palm over my lower back for a while, but I was so beat that, at 5:30pm, headed to bed to lie on my side with my body pillow. I got out of the car, had another contraction in front of the hospital, and then Ray and I were escorted into triage. A young resident entered to check how far along I was, and broke my waters accidentally in the process. She then turned to a nurse, and told her that I was 3 to 4 centimeters dilated. “3 to 4 centimeters only?! I’m still in early labor?! !” I started to cry hysterically, and thought that I’d have to get an epidural to manage the pain, as I could not imagine enduring much more. A doctor entered with the resident, checked me again, and stated frankly, “Uh. She’s eight centimeters.” They let us know that they were in the process of preparing a delivery room for me. The contractions were excruciating–they were the worst pains I’d ever felt in my entire life. “Honeyyy!!! !” I screamed multiple times. “I don’t know if I can do this! I think I’m going to die!” I later found out we were in triage for a full hour and a half before they finally moved me into a delivery room a few doors down. The nurse in the delivery room told me that I had to have an external fetal monitor and IV, and asked if I wanted an epidural. Ray was well aware of my birth preferences, and replied, “I thought you had wireless fetal monitoring. She doesn’t want an IV. No epidural.” The nurse put a hep lock into my hand instead of an IV. The tape was flimsy, and the hep lock fell out of my hand three times before she finally gave up. My doctor and Caprice arrived shortly after we did, and Ray stepped out of the room. My doctor checked my cervix, and exclaimed, “She’s 10 centimeters dilated with an anterior lip. Almost.” I asked if I could labor standing, but my doctor immediately said, “No. You’re ready to deliver. Where’s her husband? Can you call him?” Caprice rang him, and he rushed in with a mouth full of pizza. My doctor had me wrap my arms around my thighs, and I propped my feet up on a squatting bar that was attached to my bed, while Ray and Caprice helped me hold up my legs and supported me on either side. “Take a deep breath in, hold your breath, and push for 10 seconds. Direct your pushes where my fingers are,” she guided, as she gave me a perineal massage to help minimize tearing. I pushed three times consecutively with each contraction, screaming each time. After 12 minutes of pushing, Ray exclaimed, “Do you want to know a surprise?” “No! What’s the surprise? !” I cried. “Do you remember when you said you wanted a baby with no hair like in your family, and I said I wanted one with hair like in my family? She has hair!” “What?! !” I exclaimed. My doctor asked me if I wanted to feel her head, and I reached down to feel the top of my daughter’s head while she was still inside me! Realizing just how close I was to finally meeting her, I made sure to push extra hard. After two more rounds of pushes with the next two contractions, my doctor lifted her out of me, pausing momentarily to check that her umbilical cord wasn’t wrapped around her neck, and rotating her to relieve her shoulders on her way out. I had pushed for 15 minutes total. Though she was my first, this was certainly a PR that would be hard to break. Ray and Caprice later told me that she looked like she was surfing a wave of amniotic fluid as she entered the world. My doctor immediately placed her on my belly, as her umbilical cord was too short for her to reach my chest. I was in complete shock. She came from inside of me?! 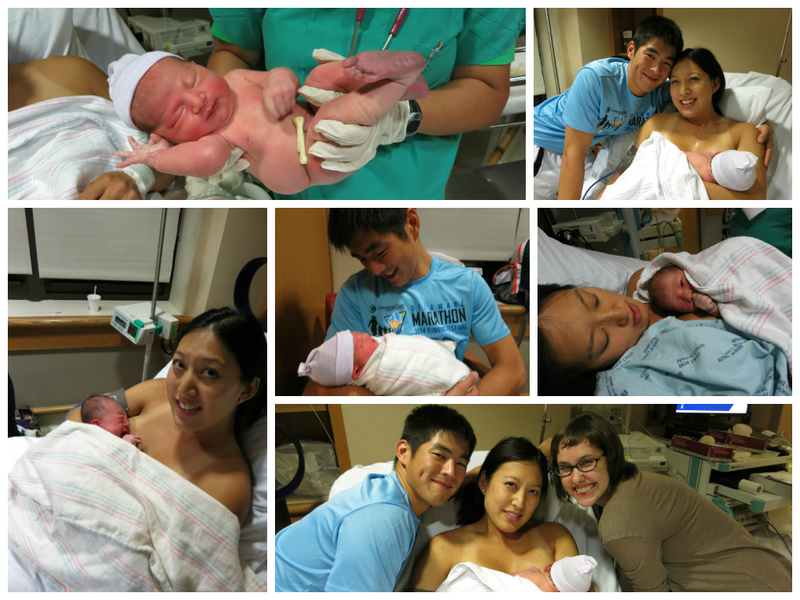 Ray cut her cord, and I was grateful to have skin-to-skin contact with her for two full hours. I learned in the film “Breastmilk” that, during the Breast Crawl, every newborn, when placed on their mother’s abdomen soon after birth, has the ability to find their mother’s breast on their own to breastfeed. I allowed her do just this, and she latched on when she reached my right breast. Giving birth to my daughter naturally was, indeed, the most painful, formidable experience ever, but it was also, by far, the most amazing experience of my life. My eyes still well up with tears when I think about the moment I laid my eyes on her, full of life, covered in amniotic fluid on my belly just after birth. I’m still in awe that Ray and I created her, our perfect being. I’m astounded that she came from my womb, and I birthed her. Keira Sage was born on Saturday, July 19, 2014 at 11:43pm at 38 weeks 6 days pregnant, weighing 7 pounds 4 ounces and measuring 20.5 inches long. My sincerest gratitude to (Sage) Caprice for being there before and during the pregnancy as my doula, prenatal yoga teacher and friend, my mom Julie for driving our car to my apartment so that we had a proper ride to the hospital, my amazing doctors who were patient and attentive with me at each doctor’s visit, and provided the very best experience in the delivery room, and, last but not least, my husband Ray for always being so supportive of me as my partner and best friend. I have so much love for you. 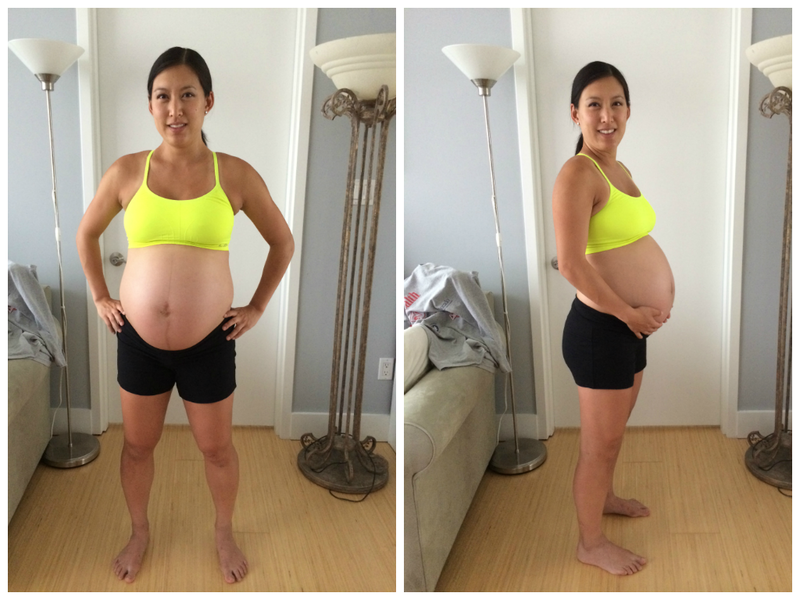 Categories: Athlete, Pregnancy | Tags: Caprice Abowitt, Childbirth, Doula, Epidural, First Time Mother, Hospital, Ironman, Keira Sage, Marathons, Natural Unmedicated Childbirth, Personal Records, Pregnancy, Third Trimester, Ultramarathons | Permalink. Last Thursday seemed as if it would end as just another ordinary day. I had a pleasant day at work, as usual, hosted dinner at Ippudo, my favorite ramen restaurant in New York City, for some of my family visiting from out of town, and then led them to try tasty Japanese desserts at Chikalicious Dessert Club nearby. My husband and I finally entered our apartment at 11:00pm, and I immediately headed to the bathroom to pee, of course. I looked down at the toilet, and noticed some blood. Our ordinary day changed in that instant. We still didn’t have a nursery prepared, we hadn’t packed a hospital bag, and I still had emails to send to staff and teachers at my yoga studio reminding them that I could give birth soon! Most of our nursery items had only arrived at our door that day, and were waiting for us at our door when we had arrived moments ago. 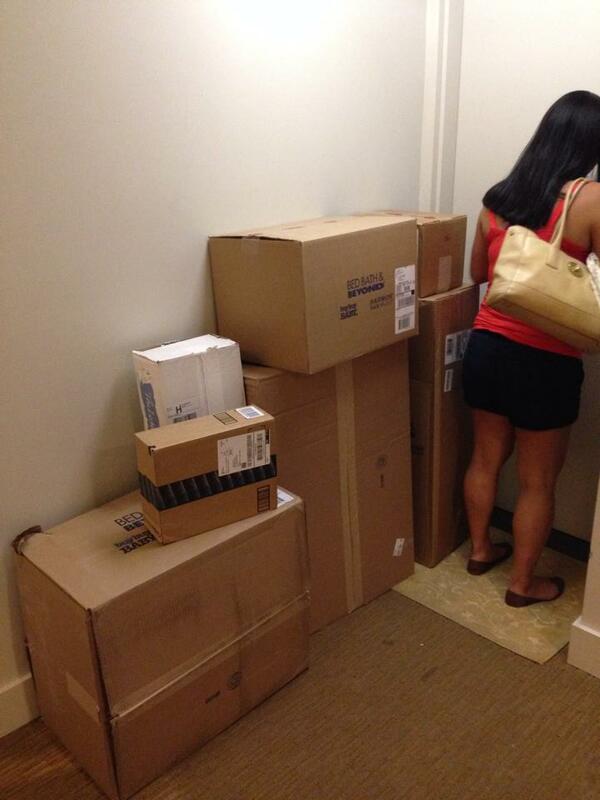 My husband began frantically opening all the boxes, and setting them where he thought they belonged. I started tossing items together in a hospital bag, grabbing some of the items he had just un-boxed. We then both spent hours taking care of work, just in case we’d be busy the following day! The following morning, my husband and I packed our hospital bag, picked up my breast pump at Target that was provided by my health insurance, and headed over to my doctor’s office to get examined. We were told that I had experienced bloody show and was 2 centimeters dilated! Also, our daughter weighed in at approximately 7.5 lbs! It was my first cervical exam of the pregnancy, and quite an exciting one at that! That weekend, my husband completed a 116-mile long ride and 18-mile long run for his upcoming Ironman, Ironman Mont Tremblant, while I decided to cut my planned training schedule, opting to take a rest day on Saturday, forgoing the 4-mile race I had registered for–I did, however, take Prenatal Yoga and then go on an easy 4-mile run home from my studio on Sunday. My husband and I dedicated the remaining hours of the weekend to vigorously cleaning and organizing our apartment! I completed our nursery and cleaned our pantry and fridge, while my husband finally organized our storage closets, after months of my asking him to do so! The frantic activity around our apartment has quieted since last weekend, and I’ve resumed my regular exercise regime. However, my husband and I are aware that I could go into labor at any given moment now. She’s coming…soon! Categories: Athlete, Pregnancy | Tags: Hospital Bag, Nesting, Nursery, Pregnancy, Running, Third Trimester | Permalink. Happy 3-year wedding anniversary to us! While the majority of Americans are spending the day either at the beach or at barbecues, celebrating Independence Day with their family and friends, July 4th is significant to my husband and me for a very different reason–we got married on this very day 3 years ago! This particular anniversary is an especially special one for us, as it’s the last before our daughter arrives. What did we do on our 3-year wedding anniversary? Naturally, we started the beautiful morning with a run together, as the skies were overcast and before the rain came down! 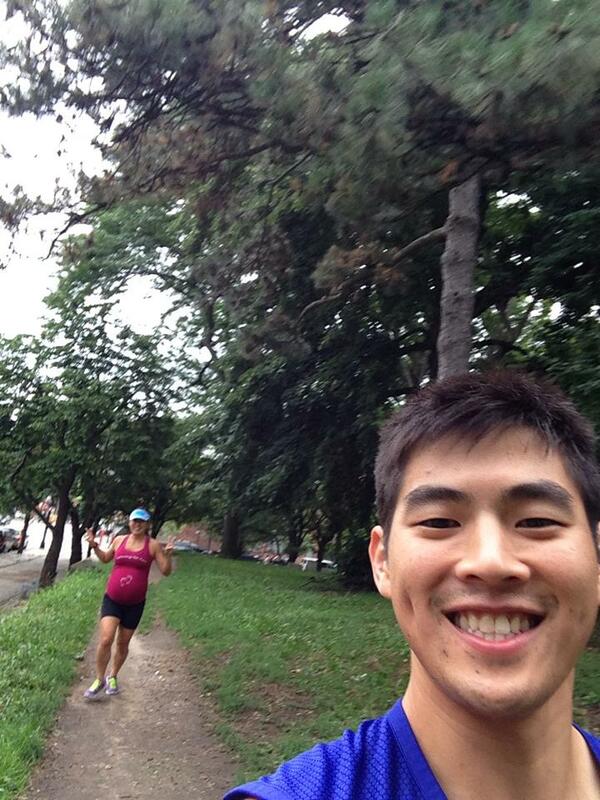 We headed off for an easy run along the trail that surrounds Fort Greene Park near our home. Once we arrived at the park, we ran a few loops at our own respective paces–he literally ran laps around me. We enjoyed lunch and watched the World Cup at Putnam’s Pub & Cooker, a neighborhood restaurant known for their local, organic ingredients and tasty fare, before heading home to FINALLY open the gifts that were delivered for our baby shower, and start preparing our baby room. We had had a roommate staying in what would become the baby room finally move out earlier this week after ten months, so you can only imagine how intense the urge to nest grew and how terrible the anxiety I had that I’d deliver early was! I continued to organize our gifts, and take inventory of what we had and still needed, and my husband drove to Connecticut to pick up the crib, changing table and other hand-me-downs we’ll receive from his sister. 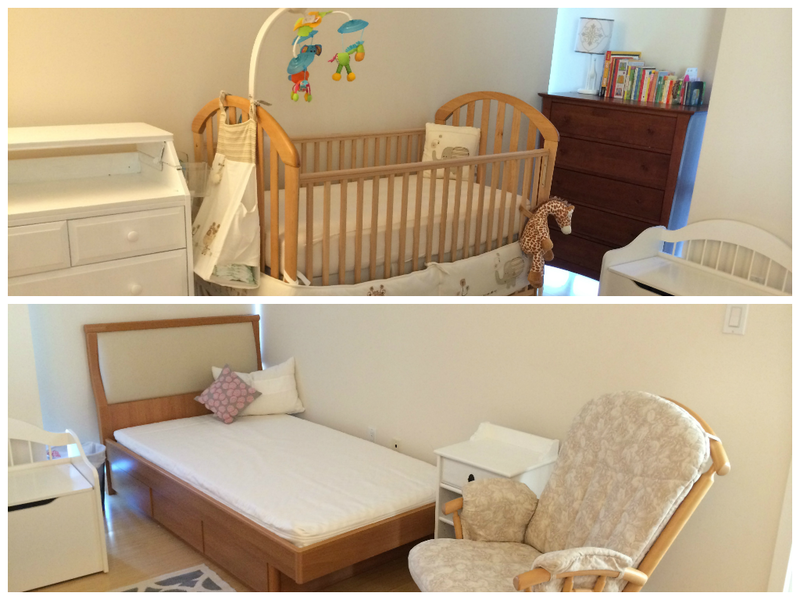 I’m uber excited that we’ll be able to finally set up our baby room! 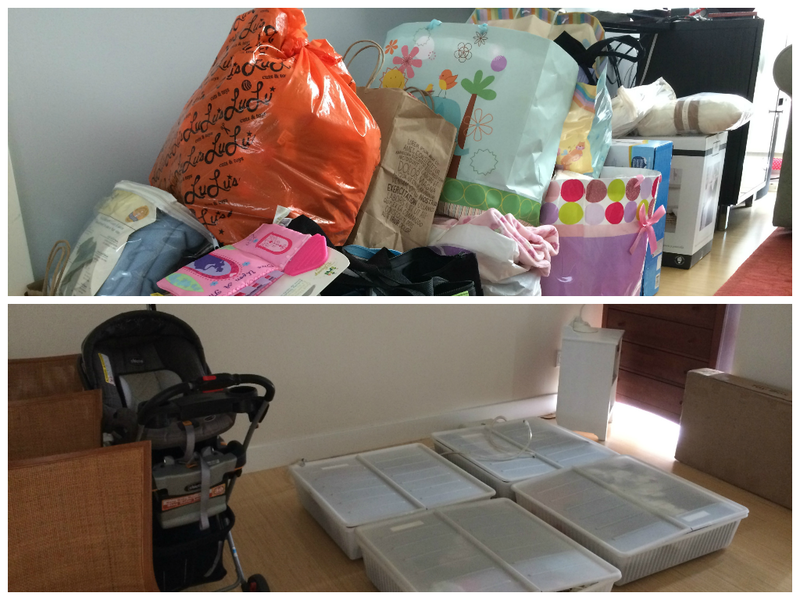 You’ll see our “before” photos below–I can’t wait until we have an “after” photo! 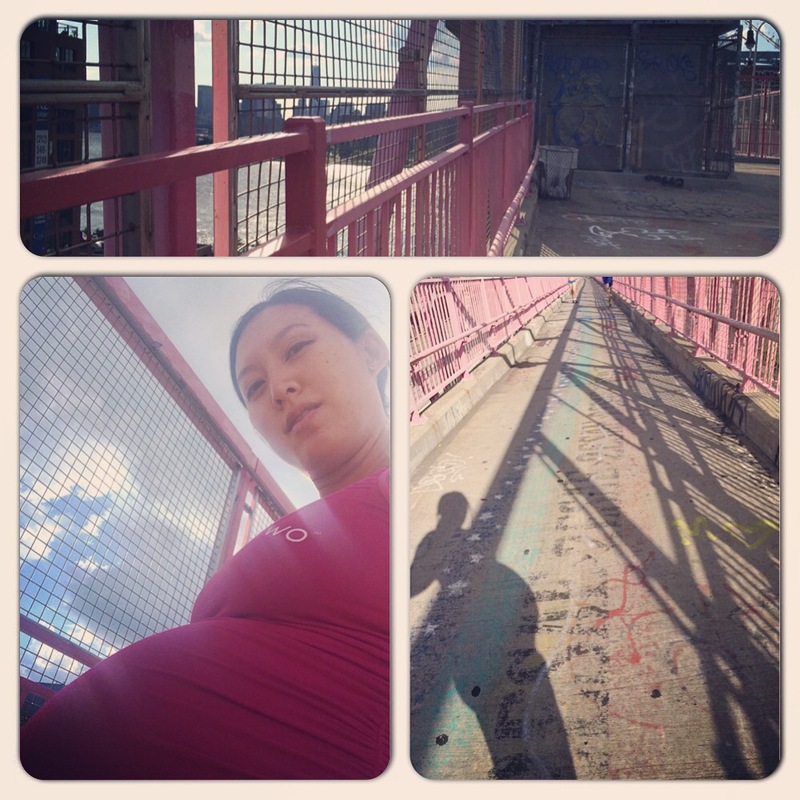 Categories: Athlete, Pregnancy | Tags: Baby Room, Fort Greene Park, Fourth of July, Independence Day, Nesting, Pregnancy, Running, Third Trimester, Wedding Anniversary, World Cup | Permalink.